A powerful, blazingly honest memoir: the story of an eleven-hundred-mile solo hike that broke down a young woman reeling from catastrophe--and built her back up again. At twenty-two, Cheryl Strayed thought she had lost everything. In the wake of her mother's death, her family scattered and her own marriage was soon destroyed. Four years later, with nothing more to lose, she made the most impulsive decision of her life: to hike the Pacific Crest Trail from the Mojave Desert through California and Oregon to Washington State--and to do it alone. She had no experience as a long-distance hiker, and the trail was little more than "an idea, vague and outlandish and full of promise." But it was a promise of piecing back together a life that had come undone. Strayed faces down rattlesnakes and black bears, intense heat and record snowfalls, and both the beauty and loneliness of the trail. 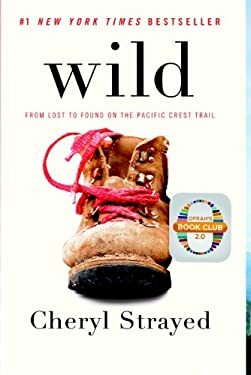 Told with great suspense and style, sparkling with warmth and humor, "Wild "vividly captures the terrors and pleasures of one young woman forging ahead against all odds on a journey that maddened, strengthened, and ultimately healed her. Used Very Good (19 available) Great condition for a used book! Minimal wear. 100% Money Back Guarantee. Shipped to over one million happy customers. Your purchase benefits world literacy! Used Good (8 available) Former Library book. Shows some signs of wear, and may have some markings on the inside. 100% Money Back Guarantee. Your purchase also supports literacy charities. Used Good (5 available) Shows some signs of wear, and may have some markings on the inside. 100% Money Back Guarantee. Your purchase also supports literacy charities. New (200 available) BRAND NEW. Over 1.5 million happy customers. 100% money-back guarantee. Make your purchase count: support Better World Books' worldwide literacy partners.